Sorry for the late page update. I did a small comic convention here in Calgary on Saturday and I worked on Sunday and just totally forgot what day of the week it was. 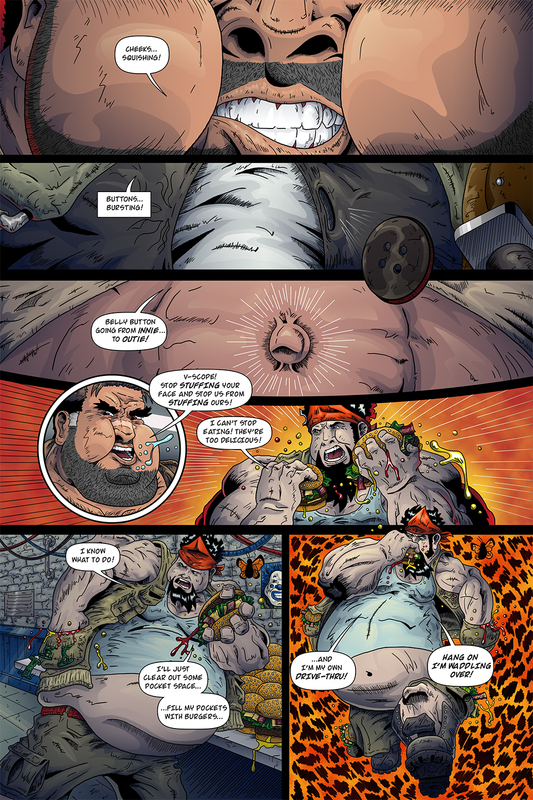 Today’s page has Team Stryker at their most burger-filled which has been a ton of fun. I almost wish that I could do a separate comic of chubby TS just for my own enjoyment. Team Stryker Mission 009 is still on track to be completed for the end of August. I’m hoping to add some extra bells and whistles to the website around the same time. I’ve had a couple of requests for people to be able to purchase the issues from the website so I’m going to see what I can do to make it as easy as possible to get Team Stryker the way you want it. For all Team Stryker updates keep an eye on Facebook and Twitter.